Jail Canyon is a worthy day trip as well as an interesting place to camp. The ghost town of Ballarat lies within easy driving distance with a small store and curator. An old miner’s cabin lies at the end of the rough route to Jail Canyon near a ravine with some aging cottonwood trees. There are a couple of flat areas to camp nearby with a great view of the canyon below. The wind can howl up the canyon with strong gusts rocking our truck while sleeping overnight. A guest book in the cabin shows signatures from visitors from all over the world. The adopted cabin has been maintained to arrest decay so others can experience this mining piece of history. Thankfully, groups of off-roaders adopt the many lonely cabins in the area, thus preserving history for all to enjoy. A picnic table next to the cabin offers a lovely spot to fill up before hiking the area. A wood framed privy sits near one of the walking trails. Years ago we visited when the outhouse was painted blue with puffy clouds and the inside sported a hand carved rattlesnake for the toilet paper holder. You could open the door to see down the canyon while doing your business. Sadly, the little privy must have lost its caretaker as on our last visit the door was partially off its hinges and the unique carved rattlesnake was gone (hopefully not stolen). Speaking of rattlesnakes, always check the area around old outhouses for rattlers, scorpions and black widows, before venturing inside. From the cabin there are several hiking trials to the mining areas. 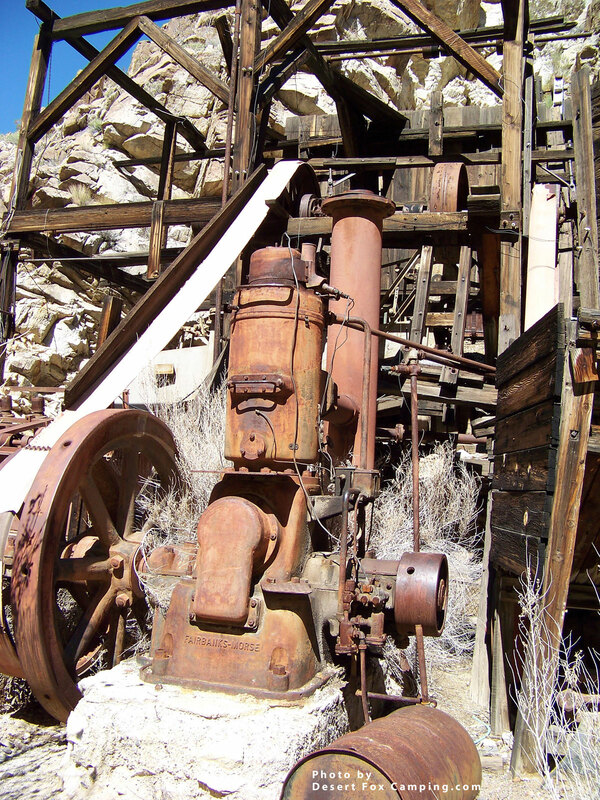 You can walk along a willow lined stream to go further up the canyon to see wood trams, rails, a steam boiler and other mining equipment left behind as ghosts last known as the Corona Mine. Carry water as it is easy to lose track of time while exploring, and the canyon gets steep and hot with little shade. 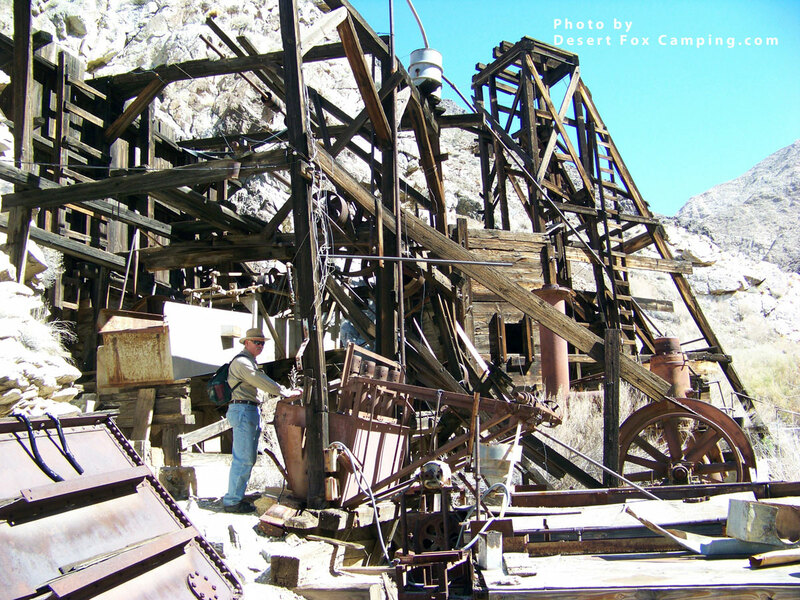 This mine has had several names since 1899, producing gold, silver, lead and copper from the quartz veins discovered then. 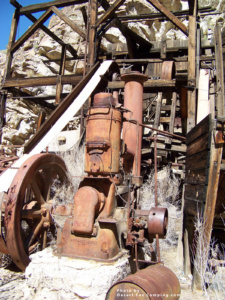 At one time a 3 stamp mill was operated with a water wheel powered by the spring. This was destroyed by a flash flood per Roger Mitchell who wrote one of our favorite guide books, Death Valley SUV Trails. Mines of every kind from sulfur and talc to silver and gold, litter the vast 3 million plus acres that comprise the Death Valley National Park. Many of the mines were successful creating boom towns, while others were simply a ruse to make money from eager investors. Ghost towns now lie where mines went bust and were abandoned. Death Valley Scotty was one of the most colorful characters who told tales of his secret gold mine in the vicinity of Scotty’s Castle. Access the rough 4 wheel drive route from the northern end of Indian Ranch Road (graded gravel) on the west side of the Panamint Range, not far from the ghost town of Ballarat. Access Indian Ranch Road from the Trona Wildrose Road (paved) from the south which becomes Panamint Road from the north. This road runs between the Argus and Panamint Ranges. Jail Canyon goes into the Death Valley National Park boundary. Get a guide book or map of Death Valley from our Gear page for more detailed directions.